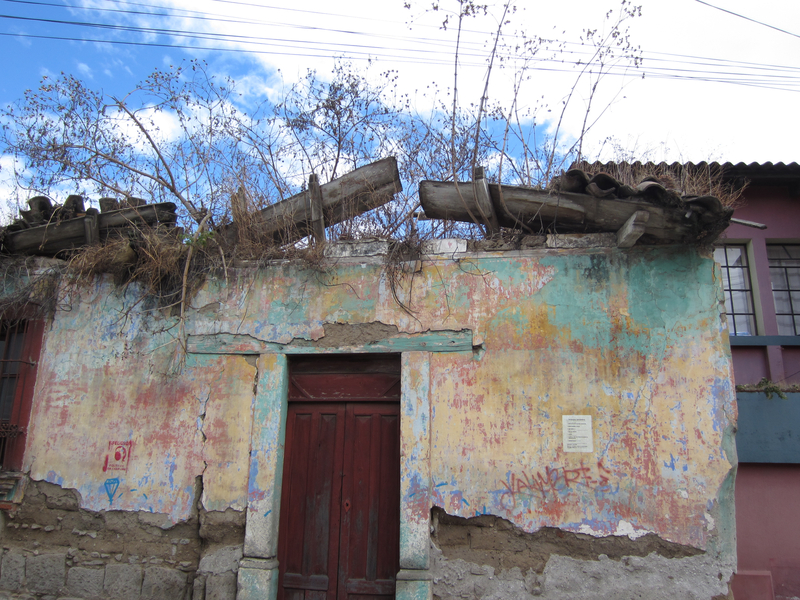 Photo taken on the streets of Xela, Guatemala. I could never tire of photographing the amazing buildings and homes in Guatemala. Many like the one pictured above were in various stages of crumpling while others in places like Antigua were gorgeously restored to their colonial prime. What I found so incredibly fascinating about the older, unrestored buildings was the history in them was easily identified in the layers of paint colors. I begin to imagine what this building would have looked like when it was yellow, pink, green and blue. I also adored the plant life growing out of the tiled rooftops. Sometimes it got pretty wild like in the picture above while other times it was simply just a single weed or a spray of brightly colored flowers. I could have taken hundreds of pictures of the buildings if only I had more time! For more stories and photos on my Guatemala trip, please visit thirdeyemom. What a gorgeous wall! There are walls like this in Antigua too but I didn’t get time to take you to my favorites! I love the crumbling, weed covered walls and roofs the best. Big like. Great image, pastels and life. Thank you !!!! More coming soon!